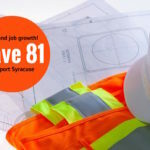 In December 2016, the Town of Manlius Board approved a resolution in support of Interstate 81’s existing highway alignment in the City of Syracuse. However, the Town Board finds that such a scenario is unlikely — causing other negative impacts. Read the Town of Manlius’ full resolution here.